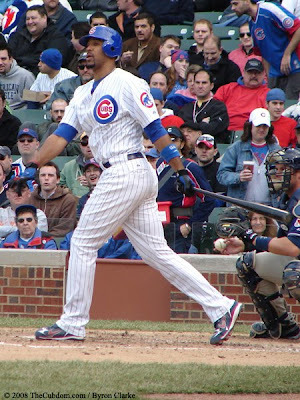 The rumor mill is swirling that the Atlanta Braves are trying to acquire first baseman Derrek Lee from the Chicago Cubs. If this is true, then I don't get it. Derrick Lee has had an outstanding major league career, but if he was going to be playing for Atlanta, he should have been here years ago. We already have one hobbling first baseman in Troy Glaus, so why would we pick up one with an ailing back? Furthermore, the numbers for Glaus and Lee are very close to the same this season. They both have hit 16 home runs, and both have less than 75 RBIs. The only way this would make sense to me is if you traded the two straight up for each other. That might work for the Cubs simply because Lee is a free agent after this season and they aren't going to be willing to pay him any huge salary numbers on the open market at this stage in his career. This would also wash with the Braves who are just biding time for their future first baseman, Freddie Freeman, to get ready for the big show. If all Glaus and Lee do is exchange uniforms, it might be worth a try for the Braves. On the other hand, if anymore Braves are involved, I say no deal. Unless of course Chicago wants to take Nate McClouth as well. Brian McCann: Walk-Off Homer? Wait...Yes! Atlanta Braves: Is It Over Now? Drew Butler: The Butler Did It! Bobby Bowden: "I Was Pushed Out..."
Ryan Mallett: This Year's Jevan Sneed? Georgia: How Crucial is Crucial? Atlanta Braves: Whose On Third? Houston Nutt: Hotty Totty, Gosh Almighty!